WTI crude prices have climbed above $51.50/b this morning. WTI opened at $51.18/b today, a significant jump of $0.94 above yesterday’s opening, and the highest opening price in four weeks. 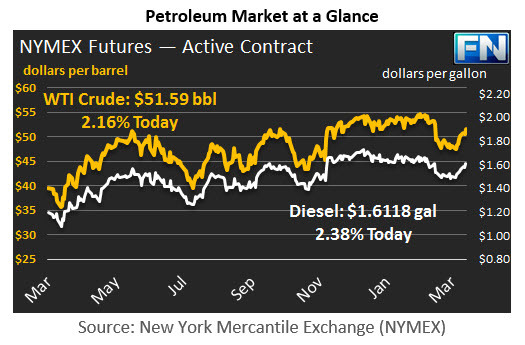 Current prices are $51.59/b, $0.56 above yesterday’s close. Product prices also have risen significantly. Diesel opened at $1.5982/gallon in today’s session. This was an increase of 3.48 cents (2.23%) above yesterday’s opening price. Current prices are $1.6118/gallon, up 1.95 cents from yesterday’s close. Gasoline opened at $1.7269/gallon today, a rise of 3.19 cents, or 1.88%, from yesterday’s opening. Prices are $1.7303/gallon currently, up 0.86 cents from yesterday’s close. Today’s opening price for gasoline is not only the highest price of the year, it is the highest price in twenty months. Gasoline prices have not been this high since August of 2015. Prices rose yesterday upon reports from Reuters that the 200-kbpd North Sea Buzzard field was closed for unplanned repairs. The Buzzard field is a key contributor to Forties crude, which is one of four constituents of Brent crude, the key European light sweet crude marker. The “BFOE” quotation is an abbreviation for the “Brent-Forties-Oseberg-Ekofisk,” crude basket. Although the repairs are expected to be complete within a day or two, Brent crude futures have risen to approximately $54.80/b currently. Adding to the Brent supply disruption, the API released its inventory data yesterday. 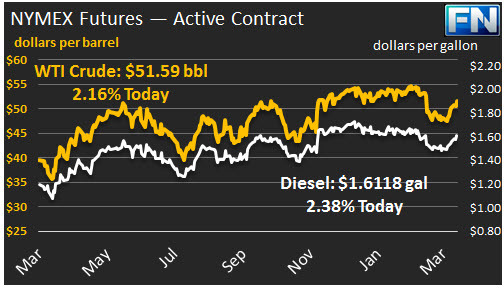 The API data reportedly showed a U.S. crude stock drawdown of 1.83 mmbbls, plus a gasoline stock draw of 2.6 mmbbls and a diesel stock draw of 2.09 mmbbls. If the EIA data shows a weekly crude stock draw, it will be only the second one so far this year.